The Children’s Home is currently a department of the Cherokee Boys Club. 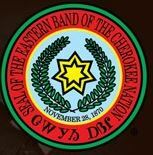 It receives no operational funding directly from the Eastern Band of Cherokee Indians. The operations are monitored by a state licensing consultant from the Department of Health and Human Services and a contract supervisor with the Bureau of Indian Affairs. Funding is provided by the Bureau of Indian Affairs through a Social Services contract and by the state board payments received from the counties who place children who are in their custody. The Children’s Home also hosts an annual golf tournament each year. The Cherokee Children’s Home is a 501(c)(3) non-profit, charitable organization. Also, we accept payroll deduction forms for Tribal Employees and Boys Club Employees. You can donate $1.00 a paycheck and have it automatically come out of your paycheck and go directly to the Children’s Home! All donations are fully tax – deductible!